Red Parsley: Retro News - PS1 Classic Lineup! 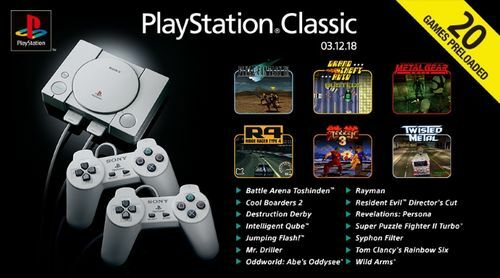 Retro News - PS1 Classic Lineup! 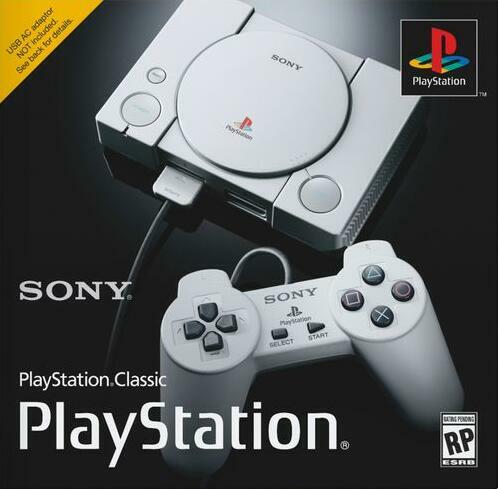 I don't usually cover stuff like this here but, having missed out on many PS1 games at the time due to my fierce Sega allegiance, this latest 'mini' console release is one that I have at least a bit of interest in. It was initially announced a few weeks ago accompanied by few details. Apparently the dinky console would come with a pair of original (non analogue) controllers for two-player splendidness, and twenty original PS1 games would be loaded onto it but, no more info was forthcoming. Actually, that's not true - a few of the bundled titles were divulged at the time of the announcement but a majority remained a mystery. That is, until now (tootle tootle)! Indeed, the full line-up has now been unveiled and the reaction has been... somewhat mixed. I imagine most interested parties will have compiled wish-lists in their heads over the intervening weeks and I'm no different, but I figured I'd take a look at the official selection. This 'look' will naturally be from the perspective of someone who has never been a big Sony gamer, and certainly not a fanboy (i.e. me), so it will probably be inane drivel unfit for the eyes of even a comatose marrow farmer, but that's okay since no one visits here nowadays anyway (guffaw/cry). Nonetheless, here is a look at the lucky few titles which will be split into three sections - the games included in all regions, the games only included with the console's Western release, and the games that only the Japanese players will get, and I thought I'd follow it up with my own picks. Battle Arena Toshinden - I believe this was the PS1's first 3D fighting game and it was well thought of at the time, but opinion of it soon waned following the arrival of the mighty Tekken series. Might still be good for a few laughs though. Final Fantasy VII - One of the obvious ones, right? Of course. It was one of the first genuinely emotionally-engaging games and it's still often cited as one of the best games of any type ever made, so it stands to reason. Not all the obvious ones made the cut though, so it's great to see it here. Intelligent Qube - Probably one of the more unusual choices but this 3D puzzler is certainly not without merit. It's one of those games where if you watch someone else play it you'll probably wonder what the frickin' frack is going on, and it does take a while to get the hang of it, but once you do it's a pretty great game. Jumping Flash! - Named by many as the first ever true 3D platform game, this peculiar Sony release certainly adds a bit of variety to the lineup with its inclusion just because of that, but it's also a unique game to say the least, owing to its first-person perspective as well as the extreme heights you can reach when jumping. I've long been a fan too - I mean, where else can you play as a mechanical rabbit? This underrated oddity is most welcome here. Metal Gear Solid - It was a masterstroke by Hideo Kojima to resurrect the little-known Metal Gear series. The result was basically an entirely new game which was not only awesome but also popularised the entire 'stealth' genre. Even if it wasn't great, though, any game that lets you play as a cardboard box is still fine by me! Mr Driller - Most of my time with Mr Driller and his happy colourful block-popping tomfoolery has been spent on the Dreamcast but it's far from a technically demanding game so I don't doubt this PS1 version is just as much fun to play. Revelations: Persona - Although the series is super-popular these days, I never really heard anything about it during its early years. This is the debut of the supernatural RPG series which sees you helping a group of high-school students through a series of spooky incidents that threaten the whole world! It was a big hit in Japan and it does sound interesting too, so I guess this makes for a great opportunity to find out how the series started! 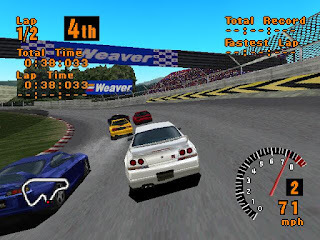 Ridge Racer Type 4 - I may be alone in thinking this but RR4 was and remains the best Ridge Racer game on any system if you ask me - it has loads of tracks (for RR standards), loads of cars, and loads of play modes including a decent career mode. Looking forward to playing through this spiffing racer again! 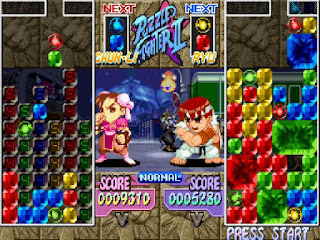 Super Puzzle Fighter II Turbo - It's interesting we get this block matching puzzler rather than one of the many fighting games of Capcom's that appeared on the PS1 (even if they are all better on the Saturn - tee hee! ), but it's an entertaining and addictive game all the same and a nice take on the tried and trusted format. 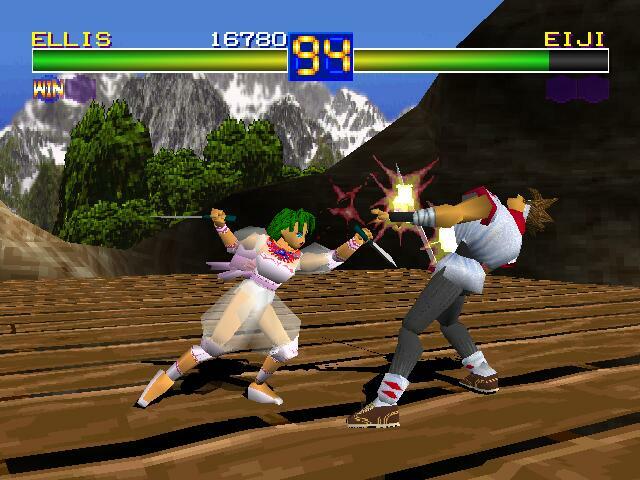 Tekken 3 - I still haven't played any Tekken games somehow, but I believe this celebrated instalment remains one of the most popular of all PS1 games and certainly its best 3D fighting game. It definitely looks like a corker, with vivid graphics, varied characters, and lively action. That makes it a sensible choice and I'm willing to bet it will be one of the most played titles here. Wild Arms - Another series I've never played, although you could say that about most RPG series', sadly. I know it's very well regarded though, so I genuinely intend to give this one a good go at some stage. Apparently it's set in the dusty lawless lands of the Wild West too - what in tarnation?!?! Cool Boarders 2 - I heard much about the Cool Boarders series at the time but I never played any so it would definitely be 'cool' (chortle) to give one of them a try. Snowboarding games are usually great fun after all. It's interesting they've gone for the second game though. Is it the best one? Destruction Derby - I think this is the first PS1 game I played but it's another one I was never keen on. It looked a real laugh when I saw friends playing it but when I got it myself, the novelty of smashing the other cars about quickly wore off and there isn't really anything more to it beyond that. Might be cool for a quick trip down memory lane but that's all. Grand Theft Auto - Amusingly, this remains the only GTA title I've played so far, but what a corking game it is! It's easy to laugh at the basic top-down graphics nowadays but it's still easy to get drawn into the shady underworld skylarkings that this classic introduced, and before you know it you've lost hours. I would be annoyed if it wasn't so great! Oddworld: Abe's Oddysee - My enduring memory of this game is the ability to make Abe fart on command (snigger!) but it's definitely a lot more than just toilet humour. I always enjoy a good flick-screen platformer too. I recall this being a mighty challenging one but what better time than to give it another go? 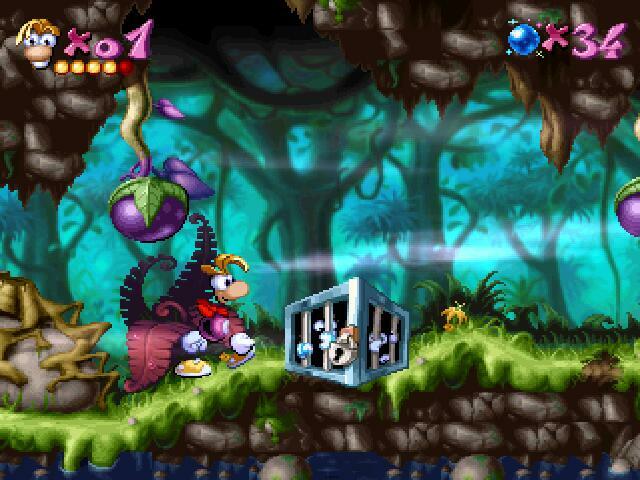 Rayman - I think I played this one briefly on something-or-other some years ago but both the character and this original game of his have remained popular all these years. It does feel a bit gimicky and old fashioned in its design but it's an enjoyable and great looking game making it a decent selection too. Syphon Filter - I believe this was one of the stealth/tactical shooter games that arrived in the wake of Metal Gear Solid and Rainbow Six's success but it definitely wasn't a stinky bandwagon-jumper. It was well designed and stylish, with tons of different weapons and gadgets to try out, and also had great graphics and characters, and had an immersive plot as well as a few ideas of its own. It probably wouldn't stand out much if you described it to someone but it had it where it counted. Twisted Metal - Although popular in its day, this vehicular combat game is another one I never played - I prefer to use my digital vehicles to race than blow up other vehicles but I suspect this one will still be good fun in short bursts, especially for two players which will be ultra-possible due to the bundled twin controllers. Arc the Lad - The Japanese sure do love their RPG's so they were bound to get a couple more of them than us in the West. This one looks appealing with it's SNES-style overhead viewpoint but more casual players might be turned off by the slow, turn-based tactical nature of the gameplay. It has a great story though. Arc the Lad II - Those lucky RPG fans in Japan get the sequel too, though curiously the third game in the trilogy is left out. Oh well, most regard this as the best of the three anyway as it basically takes everything that made the first game good and adds more! Bigger and better in every way, and a treat for any RPG fans that manage to snaffle the Japanese version of the console. Armored Core - Another type of game the Japanese are very keen on is those involving 'mechas' and the Armored Core series is one of the longest-running series to feature them. This, once again, is the first in the series, so it might seem a little stripped down in comparison to later instalments, but it's still a solid game full of seemingly endless blasting action. G-Darius - And of course, those lucky Far Eastern gamers also get some good old fashioned 2D shmups to test their reflexes, both of them horizontal-scrollers, slightly surprisingly. 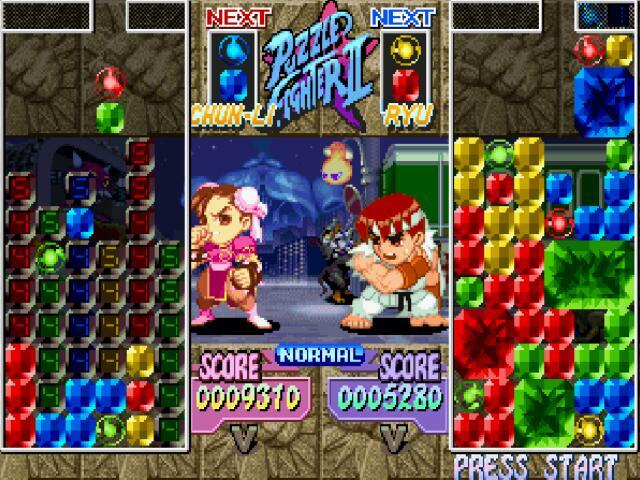 The first is this, the sixth game in Taito's stonking Darius series and an arcade conversion. 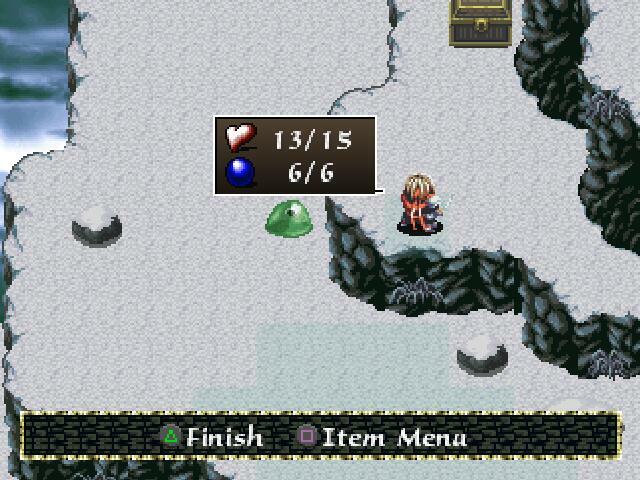 It was the first to replace the traditional 2D sprites with 2.5D polygon-based graphics and it worked well. A superb shooter. 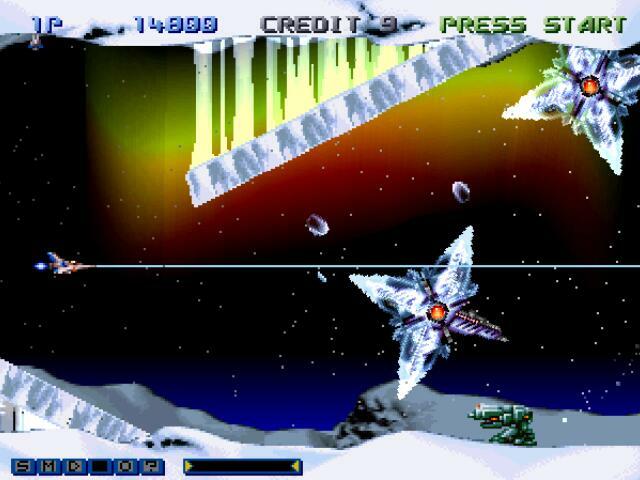 Gradius Gaiden - The second of the shmups here is the tenth (I think) game in Konami's wonderful Gradius series and was also a PS1 exclusive, making it a splendid choice for inclusion. Like G-Darius, it's the first game in the series to use polygons and it again works well. A fantastic entry in a great series and most welcome here. Parasite Eve - While obviously popular in Japan, I'm pretty sure this iconic Squaresoft survival horror game was just as highly regarded elsewhere so I'm kind of surprised they're the only ones to get it. It's a pretty great game anyway - its spooky goings-on and ghastly monsters make it one that you'll always remember playing through, even if you don't return to it. Xi - Probably better known by its Western name - Devil Dice - this isometric puzzler is another great choice for inclusion. It might not have broken new ground strictly from a gameplay perspective, but as what basically amounts to a homebrew title developed on Sony's Yaroze platform and later earning a commercial release, it's a great example of the PS1's versatility. It's a pretty cool game too! SaGa Frontier - Another RPG to appease our Japanese friends, and another Square title too. This one is certainly not their best but the SaGa games are an offshoot of the Final Fantasy series so you can be confident it will still be half-decent. Indeed. In what has turned out to be a much longer post than I had expected, that concludes my brief look at all 20 games (for both main territories) that are to feature on Sony's (probably) splendid PlayStation Classic! Whatever your preferences, there is surely a decent mixture of genres for ageing PS1 fans of all tastes to enjoy into the night, and perhaps also for a younger generation who have only ever known PlayStations with numbers in their names to explore as well. 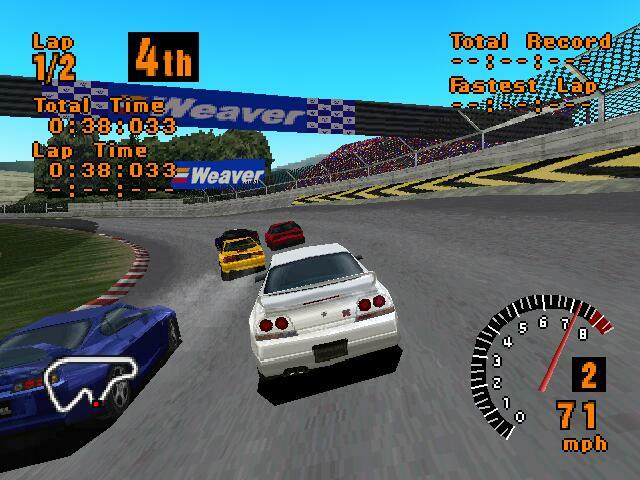 Gran Turismo - This one is so obvious I'm amazed it isn't on the Classic already. Perhaps it's down to some sort of licensing hogwash, who knows? 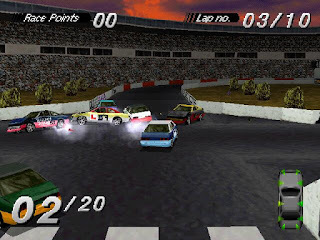 Regardless, I think we can all agree that it's one of the most pivotal and influential racing games ever made and, while it may have aged a little now, it's still a pretty great game too, and infinity-times better than the stinky plop-fest that is Destruction Derby. Yeah! My sweet Skyline will destroy all comers! Tomb Raider 2 - The PS1 hosted some very popular and successful series' but few can compare to the Tomb Raider series. The first one appeared on millions of systems, but this sequel was a (console) exclusive for Sony's system. That alone makes it a great choice but it was also a damn good game. Wipeout 2097 - Another one that is inextricably linked to the PS1 and it's enormous success is this stylish futuristic racer from ace British developer Psygnosis, which immediately built on the momentum of the popular-but-flawed original. The graphics were even flashier, it was less annoying to play, and particularly that famous 'EDM' soundtrack, all made for a memorable game which cemented the PS1's 'cool' image unto the ends of time. One of the most important of all PS1 titles. Klonoa - As far as I'm aware, this Namco title wasn't even that well known outside of Japan, but it was definitely one of my favourites on the system. Despite its lovely audio/visuals it was essentially a '2.5D' platformer, but it's a super wonderful one thanks to its flappy-eared hero and his charming surroundings. Everybody's Golf - Shut up, I don't care what you say - Everybody's Golf is more awesome than words can describe, even this, the very first game in the now-fairly-long series. It obviously lacks the refinement of more recent instalments and doesn't have all the unlockable stuff, but it's still a simple and highly enjoyable game. Crash Bandicoot - This series is another the PS1 was well known for - possibly more than any other, in fact - with the oaf of the title even becoming the unofficial PS mascot, so it's slightly bewildering that none of his adventures are featured here. I can only assume it's due to the PS4 release the trilogy recently received, but he is missed here whatever the reason. Spyro the Dragon - This fiery clot was probably not as 'big' as Crash but he was very popular all the same, so it's nearly as strange to find his series is not represented here either. I suspect it's for the same reason as Crash's absence but it's still rather disappointing. His platformy antics would surely have complimented the other games splendidly? 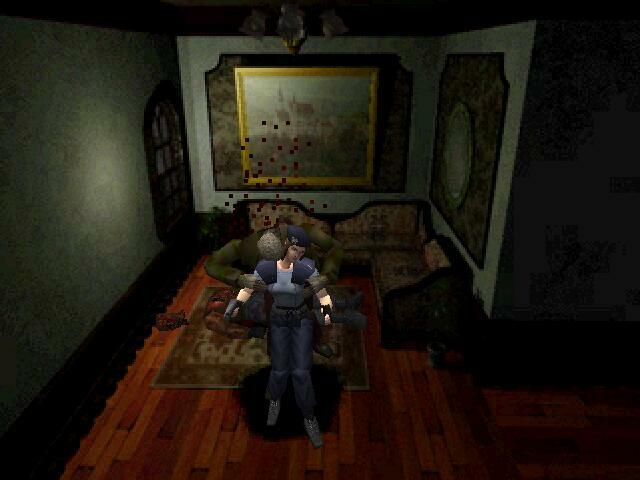 Resident Evil 2 - Yes, there's a Resident Evil game included already but perhaps this sequel would've been a better choice? I'm not sure why I'm bothered actually, it's not like I play the RE games, but I believe the second game is more highly regarded. Castlevania: Symphony of the Night - Some would say this game is more well known these days for being rather pricey, but for me it has always been known simply for being muthafrickin' awesome. It may have had 'primitive' 2D graphics but everything about the game was superb, from the sprites and atmospheric locales to the simply amazing soundtrack, but best of all is the actual design of the vast, intricate gameworld which was so good it even went on to co-name a new genre. 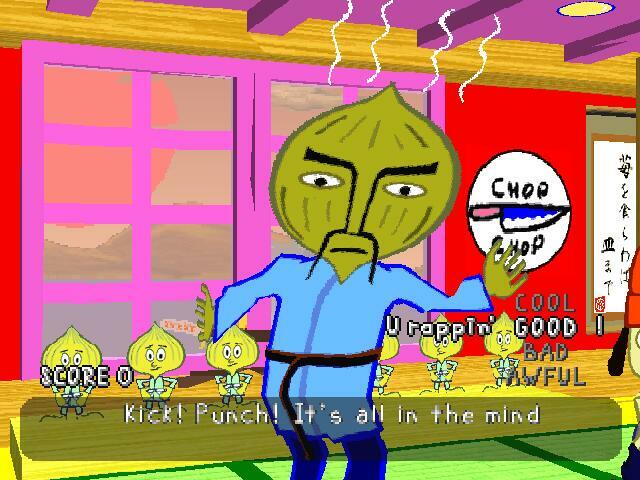 Parappa the Rapper - I think I can safely say that this peculiar game was a big surprise when it first appeared, but a very very good surprise for most. Completely original for its time, it kick-started the whole 'rhythm action' craze, but it was also very weird (in a good way)! 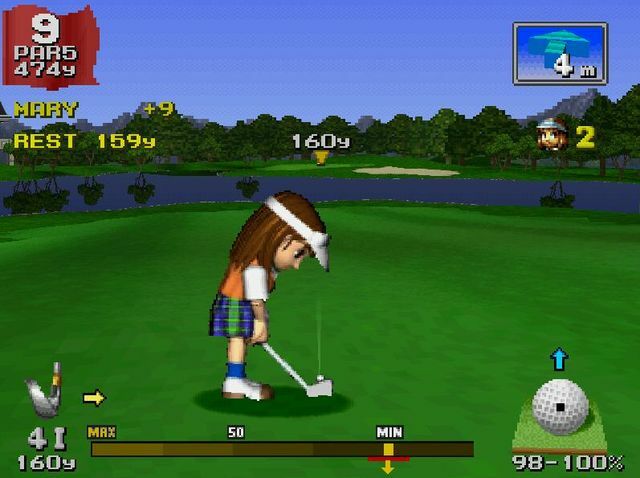 It's one of the PS1's best-loved titles so where is it? Ape Escape - Okay, this one wouldn't have been a great idea to include, but only because it requires the analog controller. I believe it was the first such title, in fact. Other than that little hiccup, it would've been great to see this wacky classic. Croc: Legend of the Gobbos - This snappy fellow may not be the first platform star you would think of but his first game has always been one of my favourite PS1 games, and it's also probably among my fave 3D platformers on any system too. Well, I could probably go on all day with these but they are the first few titles I thought of. But how about you guys? Are you happy with the selection of games Sony have given us? If not, which titles would you like to see included? Oddworld and Jumping Flash are some nice surprises, but WipEout and Tomb Raider are pretty much the games that MADE the PlayStation in its early years, seems daft not to include them. No Dual Shock controllers either, so the novelty boss fights in Metal Gear Solid will lose all their impact. Doubtlessly someone will come up with a way to put more games on it eventually, but as is I'll stick with my emulators/PSP thankyouverymuch.